Maison avec piscine dans le Salento, Puglia. 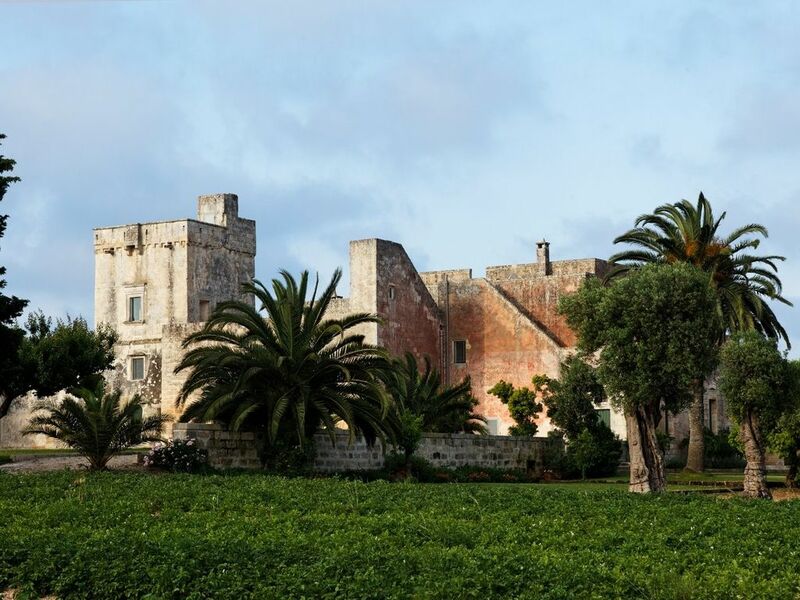 Avec sa tour datant de 1606, Masseria La Torre est un merveilleux exemple d'une ferme traditionnelle du sud de l'Italie. La propriété a été restaurée en respectant ses formes originales et des matériaux, et avec tous les équipements modernes inclus. Le corps principal de la ferme et ses annexes par l'intermédiaire de flux différents patios, les oliveraies et les jardins. La piscine est située dans la grande cour ouverte de la maison principale. Le potager bio est à votre disposition. The original agricultural activity of the farmhouse has been re-established with the production of organic olive oil, wheat, citrus and vegetables. The organic vegetable garden is at the guests full disposal. 1 salle de bains, plus salle d'eau avec douche de pluie. 1 salle de bain avec baignoire. La piscine 16x4 m (ouvert de juin à septembre) est situé en face de la grande cour ouverte de la maison principale. La piscine pleine longueur a pont en teck, vestiaire et douche extérieure. Il domine les champs d'orge de la propriété avec traditionnelle trullo et un ancien chemin de cyprès, qui était entrée d'origine de la propriété. Plusieurs vélos sont à votre disposition. Machine à laver, planche et fer à repasser dans la buanderie pour les clients. Back in December, I decided to host a family get together for 20 family members from Canada, Rome and Sardinia; in Puglia for a week and came across this property. Having never been to Puglia or knowing much about it and searching numerous properties...after several conversations with Margherita, I made the decision to book Masseria Torre Ruggeri and I was not disappointed! The property is incredible, the place immaculate with tons of space for all to enjoy...including the beautiful pool, games and entertainment room. A courtyard with a covered porch where we gathered every evening to re-count the days' adventures and sip wine. Andrea and his wife Pamela who take care of the property were wonderful and extremely helpful with anything we required. The proximity to many beaches made for great exploring and the kitchen allowed us to cook and enjoy all the fresh fruits and vegetables which showed up every morning before we even awoke. The cleaning staff was there and did a great job behind the scenes and made our stay even better. We used Gino, their Chef a couple of nights and he was excellent with his creative and flavorful meals! My family all loves to cook and have a restaurant in Canada and therefore wanted to cook on our own...however...my suggestion for anyone booking is to forget worrying about it and book Gino for all the nights and be treated to some fabulous local dishes and don't stress...that was the unanimous decision amongst our group for the next time! I could go on forever...however will end it by saying thank you to Margherita and her staff for making me look good by hosting this event at this Historic Masseria and would strongly recommend this property for someone looking to get that authentic Pugliese experience away from the hustle and bustle but within short drives to some incredible places!!! A unique experience! Comfortable and nicely decorated rooms, beautiful gardens all around, great swimming pool. Extremely efficient, cheerful and discreet staff, excellent food and drinks. We were twenty and enjoyed our stay immensely. Also lots of visits to be done in the vicinity. There are just so many wonderful things I have to say about Masseria Torre Ruggeri, I don't know where to start!! While browsing the internet for a vacation place in Puglia, I came accross this lovely property and, being a wedding planner, I first thought it would be the perfect location for a wedding. Fast forward a few weeks, I got engaged, and my now husband and I decided it was in fact the perfect location for our wedding! I got the chance to visit the masseria in the winter (on a site inspection for the wedding) and fell in love... my reaction when I got to see it again, in the late summer... well I was speechless. It was even better than the photos, even better than my dreams!!! The masseria has been beautifully restructured, all the rooms are lovely and have their own little special touches, and the common areas are perfect for large groups (we had 29 guests staying on site, as we rented the neighboring masseria Fondo Paolo as well). The kitchen is huge and completely modern, the courtyard is great, the portico stunning. The gardens and outdoor areas are perfectly maintained. The large pool and pool area were great as we had awesome weather and our guests enjoyed it very much! Margherita was so very sweet and very quick to respond and send information and answer all my questions. We were originally debating between a mid September and an early October wedding, but she recommended mid September because of the weather and, having stayed in the area for some time after the wedding, I was glad we listened to her! The caretakers Andrea and Pamela could not have been better. They were always available and willing to help out however they could, always with a big smile on their faces. The day after the wedding, the helped prepare a delicious brunch with the best potatoes I have had ever! We also hired a cook to make two dinners for us. If you stay here, you must experience this. A lovely, fresh, real Italian meal made from scratch. Absolutely delicious. And the wedding, well, it was wonderful... We could not have picked a more lovely place. Our guests are still talking about the week spent there... They are actually currently making a plan to return in 5 years! We are definitely in! Entre Otrante et de Lecce, Masseria Torre est situé au cœur du «Salento grec", une île culturelle au niveau du talon de la botte avec sa propre histoire et ses traditions. En raison de son climat doux, son patrimoine artistique, et la nourriture délicieuse, cette région, connue aussi pour ses plages de sable blanc, est la destination parfaite non seulement en été, mais aussi pour un automne, hiver ou des vacances de printemps. The price for the whole property includes: - Electricity, air conditioning, gas, water - Daily maid service (4 hours a day) Discounts available for multiple week rentals. - The Masseria can also be rented as a location for photo or film shoots. Please contact us for details.